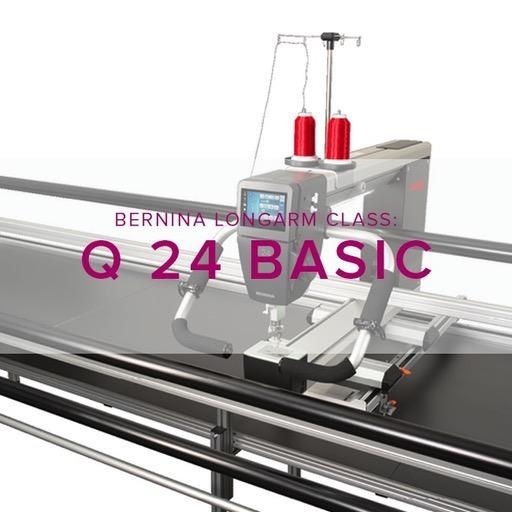 Meet the BERNINA Q 24 Longarm Quilting Machine in this exciting introductory class! This three-part class takes you through all you need to work independently on the Q24. The first two sessions will cover the basics: the third is for your first independent practice *See supply list. You will learn how to load the frame, thread the machine, and navigate the unique, user-friendly interface. You will spend time working with the different stitch modes and explore free motion quilting techniques. We will discuss prepping and planning your future projects and ways to think like a longarm quilter. Your independent practice is to be scheduled at your convenience and completed within one month of your Q 24 basic class date. Additional Supply List *Note - you will not need these supplies until your independent practice session. Thread and bobbins will be supplied for your practice session unless you want to bring/purchase your own. 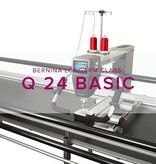 The completion of the 6 hour Q 24 Basic is a prerequisite for using the Modern Domestic studio for Q 24 longarm quilting. The rental rate is $20/hour. Interested in purchasing Qmatic? Ask us how you can attend this class for free.